Thus much time passed, and the holy Forty Day Fast approached. There was a certain custom at the monastery, which was why God had led St Zosimas there. On the First Sunday of Great Lent the igumen served the Divine Liturgy, everyone received the All-Pure Body and Blood of Christ. Afterwards, they went to the trapeza for a small repast, and then assembled once more in church. When the first week of Great Lent came again, St Zosimas was obliged to remain at the monastery because of sickness. Then he remembered the woman’s prophetic words that he would not be able to leave the monastery. After several days went by, St Zosimas was healed of his infirmity, but he remained at the monastery until Holy Week. Reading this note, Abba Zosimas was glad to learn her name. He then realized that St Mary, after receiving the Holy Mysteries from his hand, was transported instantaneously to the place where she died, though it had taken him twenty days to travel that distance. Glorifying God, Abba Zosimas said to himself, “It is time to do what she asks. But how can I dig a grave, with nothing in my hands?” Then he saw a small piece of wood left by some traveler. He picked it up and began to dig. The ground was hard and dry, and he could not dig it. Looking up, Abba Zosimas saw an enormous lion standing by the saint’s body and licking her feet. Fear gripped the Elder, but he guarded himself with the Sign of the Cross, believing that he would remain unharmed through the prayers of the holy woman ascetic. Then the lion came close to the Elder, showing its friendliness with every movement. Abba Zosimas commanded the lion to dig the grave, in order to bury St Mary’s body. At his words, the lion dug a hole deep enough to bury the body. Then each went his own way. The lion went into the desert, and Abba Zosimas returned to the monastery, blessing and praising Christ our God. Arriving at the monastery, Abba Zosimas related to the monks and the igumen, what he had seen and heard from St Mary. All were astonished, hearing about the miracles of God. They always remembered St Mary with faith and love on the day of her repose. Abba John, the igumen of the monastery, heeded the words of St Mary, and with the help of God corrected the things that were wrong at the monastery. Abba Zosimas lived a God-pleasing life at the monastery, reaching nearly a hundred years of age. There he finished his temporal life, and passed into life eternal. 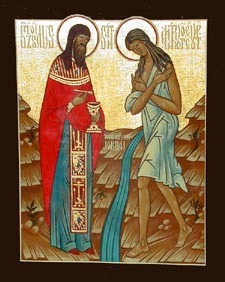 The monks passed on the life of St Mary of Egypt by word of mouth without writing it down.